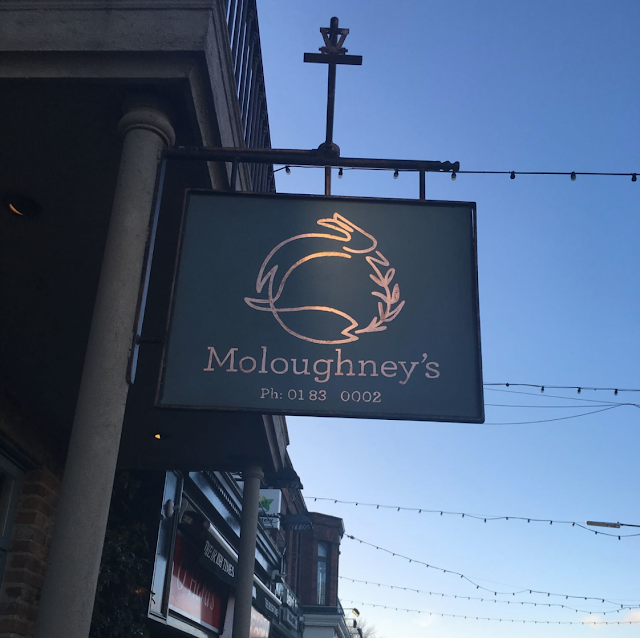 Last night I had the pleasure of taking Joanne to our favourite restaurant Moloughney's of Clontarf. You see it was Joanne's birthday and I thought I would take her to a place she loves rather than somewhere new. I first blogged nearly 5 years ago about Mol's as it is affectionately known, and now it is a firm favourite in our house. Be it breakfast, lunch or dinner they never fail to deliver ( that rhymed hehe ). We had originally planned to go New Year's day but I was swiftly submitting to the black lung so we decided to re-arrange for Joanne's actual birthday which was yesterday. When we arrived it was warm and cosy but also quiet, a peaceful Tuesday was to be expected especially after New Years. Seated in our fave spot away from the door right beside the bar ( jeez we actually have a favourite spot we are that couple ). We ordered almost immediately, we do not F about when out to dinner. In fact I think it is one of Joanne's pet peevs about going for dinner with me ( well I know it is a pet peev). Anytime we go for food, no sooner are we in the door we are back out again, her dad was the same. First out of the trap was my favourite course, the Bread Course!!! God I love the bread in here, we both got the brown seeded scones. Bread for me is one of my favourite things in life, I don't think I could ever deal with being a Coeliac, and even if I was I think would still eat it and face the consequences. We slathered the scones in butter, what a nice different idea to have scones as the bread we both thought. For our starters we both ordered the Crab & Cod open Lasagne in Bisque ( I had to persuade Joanne to get this as she was unsure of the bisque part of the dish ) as the pork ribs she wanted were out since the lunch service. Well it was blooming lovely, the bisque was so good! jammed packed with flavour, Joanne loved it! Thank god she did especially on her birthday otherwise it might have been a testy ride home. Next up was the mains, both of us ordered off the specials board, Joanne opting for the salmon and me opting for the venison. Joanne enjoyed the salmon and I chose very well, I adore venison it is one of my most favourite meats. I remember when I first had it, I was only a young chef of 17 in college in the Limerick Institute of Technology. I competed in a cooking competition in Killarney, the proviso or the brief as they say on the Great British Menu was cooking an exotic meat. I remember deciding to cook venison I had no idea why, it was hardly exotic, when I think exotic I think of alligator or something. I chose venison because when I was 10 or 11 I remember my dad won a hamper of venison playing cards in the Davin Arms in Caherdavin years ago, he was eating it for weeks! My competition dish was a loin of venison with chocolate and kirsch sauce, it sounded nuts but it worked. My college lecturer weirdly liked it and allowed me to compete with that dish, I finished second in the comp that day. Back to last night the main was a triumph , it came with cured turnip and a slightly sweet jus which reminded me alot of my comp nearly 16 years ago, christ I am old. Out came the dessert, deciding on sharing a bowl of ice cream as there was a whopping big birthday cake at home waiting to be eaten. What a meal though we love Mols, and I had full confidence Joanne would love her birthday dinner here. I cannot recommend their restaurant enough, it has such a lovely cosy atmosphere, it feels like the heart of the neighbourhood especially on the weekends when it is teeming with families out for their breakfast.